The South Beach Reef in Newport, Oregon is an outstanding place to go for a dive if you have a good boat and captain, and some calm weather. Visibility is outstanding in the ocean. When we went diving on the South Beach Reef, we saw many species of cold water coral, huge fish of all different species, and a ton of other marine life that you just don’t see on the jetties around Oregon. Some friends of ours checking out the breakers rolling over the South Beach Reef on an ordinary day in December from South Beach State Park. The South Jetty is visible on the right. The South Beach Reef has an absolute explosion of underwater life. We have seen cold water corals, huge fish of many different species, strange giant crabs (we wish we had a picture so we could do a species ID!) and a really cool reef wall. 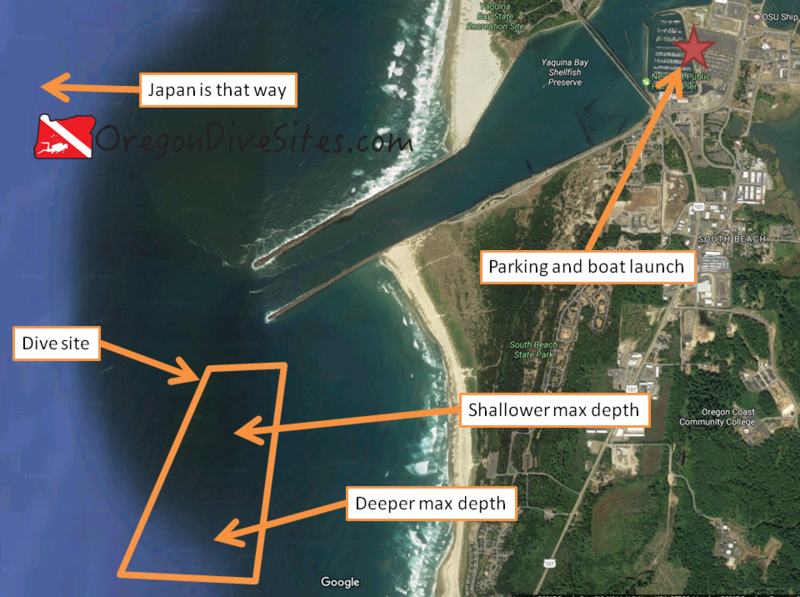 If you’re used to diving along the low viz jetties on the Oregon coast, you’ll be absolutely blown away by this dive site. It is one of the best dive sites we’ve had the privilege of diving in Oregon. Take the aquarium exit from US101 and head to the marina. This is where you can put your boat in and park your car. There is plenty of free parking at the marina. South Beach Reef is accessible by boat or a MASSIVE surface swim and LONG hike. This site can only be accessed in calm conditions. The reef runs roughly north-south offshore from South Beach State Park. The further south you go along the reef, the deeper the bottom gets. The marine chart for this area is very useful to boat captains looking for the best spot to drop divers off at for the best dive. We suggest that your boat have a depth finder to establish where the reef rises up from the sandy bottom. You want to enter the water just to the west of where the reef comes up and you will be picked up in the shallow area on top of the reef when your dive is done. Once you’re in the water, descend to the bottom of the reef and start your dive there. Depending on what the current is doing, this could turn into a bit of a drift dive. The last time we went SCUBA diving on the South Beach Reef, we had the boat follow our bubbles which was a good thing because the current carried us along for a ways in one direction when we were below 40 feet and then carried us back the other way above 40 feet. Be sure to watch your head as you come up to the surface to make sure you don’t have an unpleasant experience with a boat hull or a propeller! If conditions are good, it is fun to swim back and forth along the reef wall as you come up from the bottom of the South Beach Reef. The colors on the reef are outstanding and can really be brought out with a good dive light. We have several that we use every time we go diving in Oregon and that we recommend on our Gear We Use page. At the top of the water column on the South Beach Reef, you will most likely encounter surge. The last time we went diving here, we were sloshing back and forth on top of the reef by about five feet in either direction. Our boat was also moving with the waves which made getting on the boat a bit more of a challenge. We suggest taking a safety sausage (we ALWAYS dive with one for each of us) in case you surface away from your boat. While it would technically be possible to surface swim from South Beach State Park out to this dive site, we haven’t ever heard of someone trying it. You could also possibly use a kayak setup for SCUBA diving to access the South Beach Reef but going through the breakers (even on a calm day we usually see breakers here) would be a challenge. Instead, we highly recommend that you take a boat with a good captain out to the reef. The boat ramp on the south side of Yaquina Bay right next to the US101 Yaquina Bay Bridge is a good place to put in. Diving from a boat means that you will need to know how to enter and exit with a boat involved. We usually do a giant stride off the back of the boat that takes us out to the South Beach Reef. The boat captain usually has a floating line that he throws out when we surface for us to grab onto. Because of the nature of the reef, the current, and the surf, boats usually do not anchor and instead will hold position near SCUBA diver bubbles. For this reason, be sure to watch above your head as you come close to the surface. Running into a boat prop is a good way to die. Normally this site is not diveable. You need really calm and flat ocean conditions to make the South Beach Reef a good place to dive. Watch the surf, marine, and weather forecasts to time your trip. Don’t dive the South Beach Reef if you have any doubt about the conditions. There are plenty of other dive sites around Newport that aren’t as impacted by fickle ocean conditions. At the bottom and on the reef wall, you will probably encounter some current. We have seen no current at all, a strong current from one direction, and current from one direction at one depth and current from another direction at another depth. Near the surface, you will probably find some surge. One time when we went diving here, the surge swished us back and forth over the top of the reef by about five feet in either direction. People sometimes come out here in boats to go fishing or crabbing so be on the lookout for boats that aren’t your boat. Visibility at the South Beach Reef is often very good. The worst that we have had it here is 20 feet of visibility and the best is 35 feet. Compared to some of the sites in Yaquina Bay, this is amazing viz! Depending on the time of year, you may encounter even better viz or somewhat worse viz. Water temperature out here in the ocean usually runs between 48F in January and 57F in September. We like diving this site in the summer on a sunny, calm day. The site is diveable anytime throughout the year but it really depends on the ocean conditions to see if the site is safe to dive. You can hit 65 feet at the south end of this dive site. Toward the north, the deepest you’ll find is 40 feet. We suggest having advanced open water training and practicing entrances and exits from a boat. You may be glad you have drift diver training if you encounter current along the reef wall. This is an intermediate dive assuming your boat does a good job of staying with you and the ocean conditions aren’t too rough. If conditions deteriorate or your boat runs away, it becomes extremely difficult to get back to land. Swimming through the breakers is something that we do not want to experience. No walk assuming you’re using a boat. No surface swim assuming the boat comes over to pick you up. This is a really special dive that not very many Oregon SCUBA divers get to do. The South Beach Reef has tons of life and color on its rocky walls. It is accessible for those with a decent boat or for those who pay to have a boat and captain for the day. Remember: you need very calm ocean conditions to make this site safer to dive. You should carry a safety sausage to signal your boat or people on the shore if you get into trouble (we have a safety sausage we always carry with us and that we highly recommend). We have had friends with boats take us to this site in the past. If you know of a commercial boat operation in Newport that you have used and can recommend to other SCUBA divers, please let us know! There is a SCUBA shop in the South Beach area of Newport. They do air fills, service gear, have some gear for sale, and rent gear. Both sides of Yaquina Bay have a lot of great restaurants and bars. We like staying at the South Beach State Park campground. They have RV sites, tent sites, and yurts for rent. 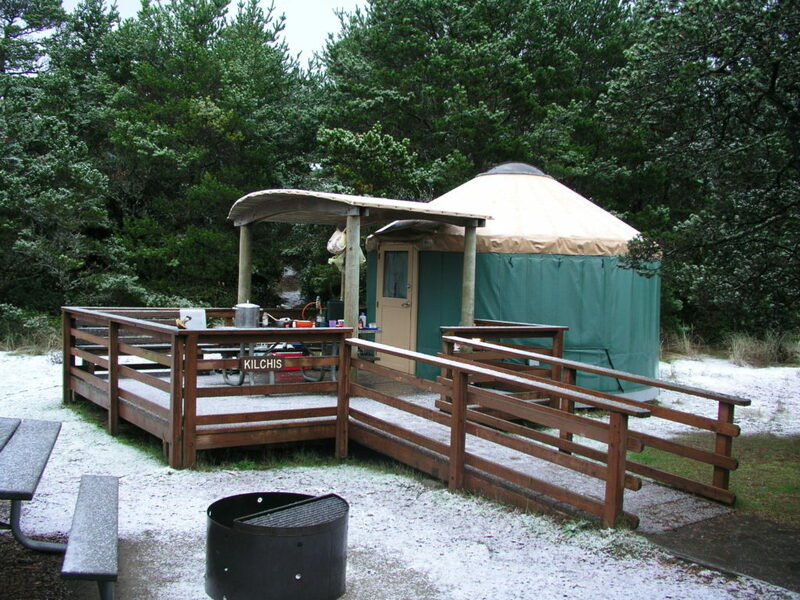 The yurts are great in the winter when it’s cold and rainy.